Arianna and Alessandro’s story is like a fairy tale, a story destined to be retold until it becomes a legend. Recognizing the near-magical quality of their tale, they called their company The Pastures of Amaltea (I pascoli di Amaltea) after the sacred goat, Amaltèa, that nursed Zeus, king of the Greek gods. 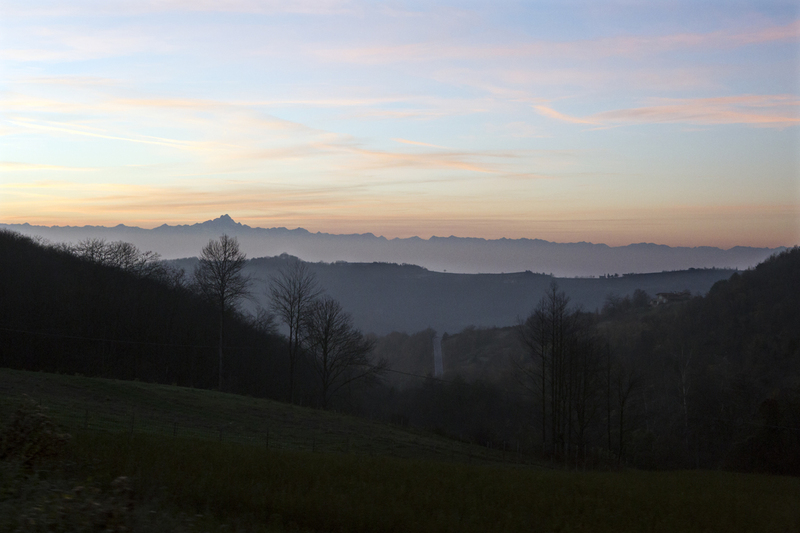 Mombarcaro, Alta Langa: For those of you who have never been, imagine undulating valleys and hills scattered with wild cherry trees, hazelnut groves, oaks, and maple trees; and in the midst of it all, an old, abandoned, irresistible farmhouse. Alessandro bought it when he was just 27 years old in 2007. At the time, he was working for a winery, but all he had to do was close his eyes and he imagined this farmhouse, the fields and forests surrounding it transformed into lush pastures. As is true for many visionaries, Alessandro is stubborn; he transformed his dream into reality the following year. 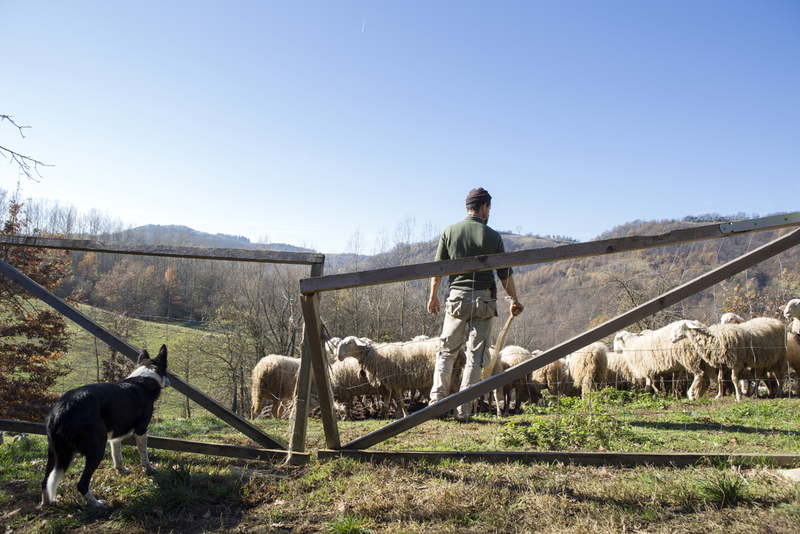 He purchased ten Langhe sheep, a breed that risks extinction, from a local breeder who also taught him the basic principles of the complex art of transforming milk into cheese. The years passed, the flock of sheep grew, and in 2012 Arianna entered the picture from the Bassa Langa (the Langhe is divided into “high,” Alta, and “low,” Bassa, according to their elevation). Alessandro and Arianna met at a party and it was, as they say, love at first sight. Arianna left her work at the Slow Food Foundation for Biodiversity and moved to live in the old farmhouse, which had been revived—so much so that today, the flock counts seventy heads of Langhe sheep. For now, their extinction has been averted. For their part, the sheep seem to be thankful, and in return give the couple high quality milk that is transformed into delicious, unique cheeses. Their favorite is the tuma (or toma), a traditional type of the Langhe. It is sweet and soft, stored in a traditional burnia, or a glass jar that conserves it over the winter. During those cold months, the sheep do not produce milk; they, too, respect the slow rhythm of the Langhe and allow themselves a season of rest in the warmth of their stables. Arianna, as women often intuitively do, reaches beyond tradition to create new recipes for cheeses, looking after them with loving care while they age on the wooden shelves. Alessandro tends to the flock of sheep, to which was recently added three cattle and two horses. He is helped by four herding dogs that are always ready to chase away predators. When you sit in the kitchen with them and taste the toma and the new cheeses Arianna has cooked up, seeing them exchange warm glances and feeling the calm flow of happiness, it is clear that together, Alessandro and Arianna have made the right choice; and you can’t help but feel immensely happy for them.